A 1984 graduate of UD, with a major in political science, Chris Christie was elected governor of New Jersey in November 2009. As an undergrad, Chris was the Student Government (then DUSC) president his senior year and he was succeeded by Mary Pat Foster '85. Foster later became Mary Pat Christie when she married Chris in 1986. The two now live in Mendham, N.J., with their four children. Chris began his legal career in 1987 after earning his law degree from Seton Hall. He joined the law firm of Dughi, Hewit & Palatucci in Cranford, N.J, where he established the firm's litigation department. In December 2001, Christie was nominated to be the U.S. Attorney for the District of New Jersey. He was unanimously confirmed by the United States Senate that same month and was sworn into office on January 17, 2002. Christie, who served as U.S. Attorney for the District of New Jersey before being elected governor of New Jersey in November 2009, received the UD Presidential Citation for Outstanding Achievement Award in 2003. 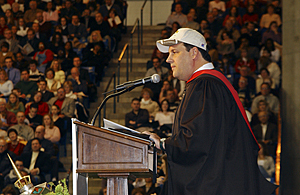 He also returned to UD in January 2004 to speak at UD's Winter Commencement. “I have nothing but fantastic memories from my years at the University of Delaware. I received a great education. I met my wife. I made lifelong friends. A knowledgeable and caring faculty mentored me. Now 20 years since my graduation, I still have friends at the University and visit the campus on a regular basis,” Christie said at the Presidential Citation ceremony in 2003. Christie also has served as an officer of the Christie Family Foundation, a private family foundation that supports charitable causes. In addition, he has served on the board of the United Way of Morris County, Family Services of Morris County, Morris County Board of Social Services and as chairman of the Morris County Insurance Commission.